Exiled from her home, the enclosed city of Reverie, Aria knows her chances of surviving in the outer wasteland — known as The Death Shop — are slim. If the cannibals don't get her, the violent energy storms will. Then Aria meets an Outsider named Perry. He's wild — a savage — and her only hope of staying alive. A hunter for his tribe in a merciless landscape, Perry views Aria as sheltered and fragile—everything he would expect from a Dweller. But he needs Aria's help too; she alone holds the key to his redemption. Opposites in nearly every way, Aria and Perry must come together to survive. Their unlikely alliance forges a bond that will determine the fate of all who live under the never sky. 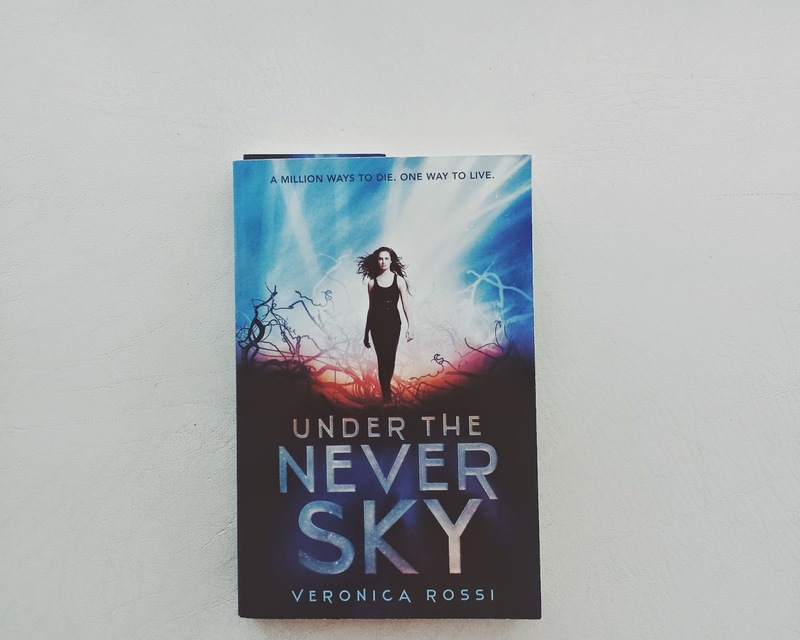 In Veronica Rossi's exciting debut, Aria and Perry must overcome their social and cultural differences in order to reach their common goal. Their alliance is constantly tested in the post-apocalyptic world that they live in, one frequently attacked by energy storms and threats from savage tribes. I had a hard time getting into the story. This was largely because of how Rossi introduced the world she built. I was just reading the first quarter of the book without really understanding what was going on. There were terms and places that were mentioned but I couldn't understand right away what they were exactly. For example, when the Realms were introduced I thought they were actual places but as it turns out they were all virtual and could be accessed via their Smarteyes - also a term that I was sort of confused with at first. I don't like info dumps but I also don't like how Under the Never Sky started. Fortunately, all my initial complaints were quickly forgotten once I got really immersed in the story. I soon realized that perhaps this is exactly what Rossi was going for. Readers would simply start to understand the world Aria and Perry was in because the story is so engaging. The key here is to keep reading. Everything will make sense as soon as the story draws you in. And it will - I promise you. Rossi's writing is beautiful. It's simple but it's enough to keep you captivated til the very end. There were chapters that ended with the most perfect lines that will surely linger well after you've turned the page. I also absolutely love how action-packed this book is. And I'm not just talking about the well-described fight scenes. Blood was spilled, people. Lots of it. Of course it's not gory but it's intense. Rossi definitely didn't hold back. The romance progressed at a good pace. Aria and Perry were definitely not attracted to each other at first but as they journeyed, they learned to be friends. When it got to the point where they realized that they have feelings for each other, it was natural. Aria and Perry as a couple? Swoon! I love them but I also love that the book really did focus on the plot rather than the romance that often happens in plenty of dystopia or fantasy books I read. It was also interesting how Rossi explored different ideas in this book. Aria is a Dweller, someone living inside a Pod with all the advance technology available, while Perry is an Outsider, simply put he lives in a tribe outside of the Pod. They had to overcome their prejudices in order for their alliance to work. I liked seeing how dynamic the characters were and how they interacted with each other given their vast differences. I also liked that the minor characters were as vibrant as Aria and Perry. Roar, Perry's bestfriend, is definitely a character that readers will easily fall in love with (I KNOW I DID). He's funny and very lively but you definitely know there's more to him than that. He's just one of the many characters the makes the story so much better. This is easily one of my favorite reads this year. I can't believe it took me this long to pick it up. 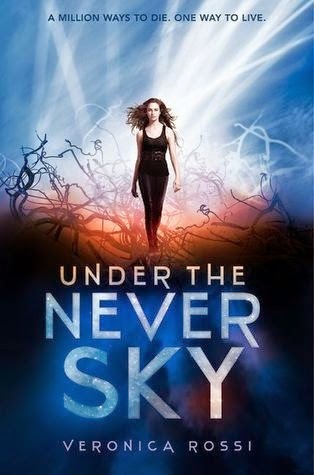 So, dear readers, all I have left to say is this: Under the Never Sky is a YA must read. There's no doubt about it. Did you miss the book signing last week? 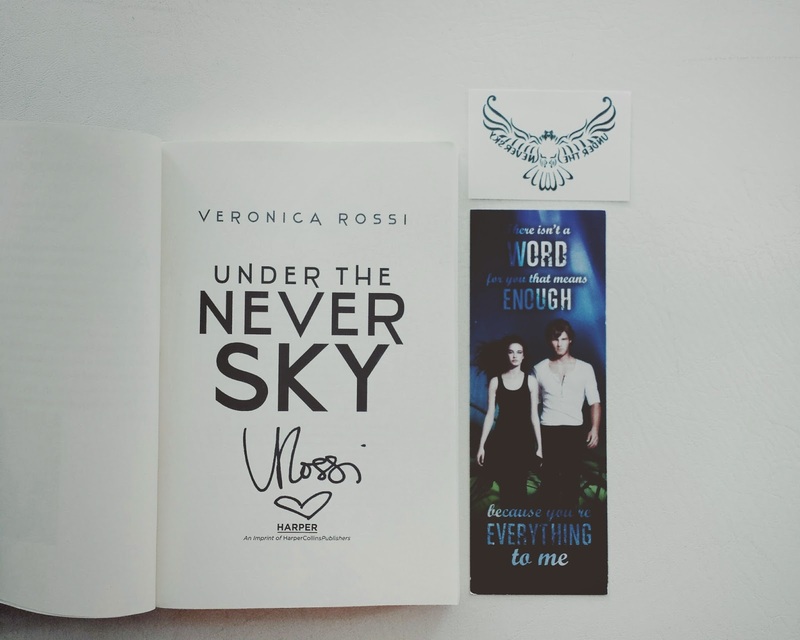 Well, I'm giving away a signed copy of Under the Never Sky along with a bookmark and a temporary tattoo from Veronica herself! WOO! This is one of my favorites, it only gets better! If you are not opposed to novellas, they are pretty good for the series as well. They give a nice insight into Roar and Liv, and Brooke! Excellent read! Nice and entertaining as a down time activity. The author is not too much mushy and has a very descriptive way to keep me interested. Makes me want to find more like it.